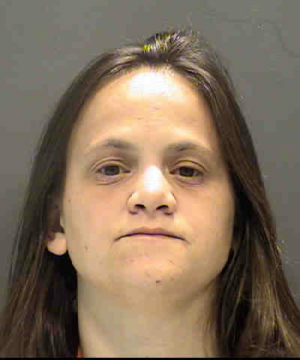 The Sarasota County Sheriff’s Office arrested a 30-year-old Sarasota woman on the night of Friday, Dec. 2, after she was found unconscious — allegedly from a heroin overdose — in a convenience store bathroom, with a 4-year-old child present, the office has announced. Just after 7:15 p.m., deputies were called to the Wawa at 3703 N. Washington Blvd. in Sarasota for a possible overdose, a report says. According to the store manager, Amanda Riley entered the store with a small child and went directly to the restroom. The report notes that the manager found Riley unresponsive on the floor five minutes later. The manager told a deputy the child “appeared frightened, was alone and uncared for and crying,” the report continues. The manager carried the child outside and waited for law enforcement personnel, the report adds. When paramedics arrived on the scene, the report continues, they treated Riley and then transported her to a hospital, “where she later admitted to buying heroin in north Sarasota earlier that night before injecting it while inside the store’s bathroom,” the release adds. She told a deputy that she neglected the child “because the drive to use heroin was too strong,” the report says. The 4-year-old child was found safe and placed into the custody of relatives, the release notes. Riley, whose address is 2845 Stoneland Lane in Sarasota, was charged with felony Child Neglect without Great Bodily Harm, the release adds. She was placed on supervised release early the morning of Dec. 3, the release says.